Writing centers or stations can be a great fit to use in a structure like Daily 5, where students are choosing and working on meaningful tasks independently or with partners. Often, however, keeping the writing activities fresh and engaging within those centers can be time consuming, draining, and downright difficult. I had tried lots of things that started out with promise but soon became stale and eventually abandoned, or that required too much of my time to change out. 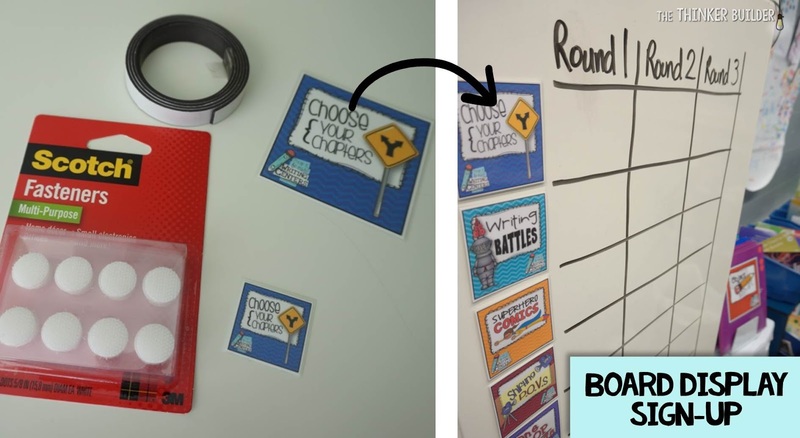 I wanted writing activities that I only needed to explain once before students could do independently, but also kept students' interest and engagement time after time. And that's when I started creating my "Keep It Fresh! 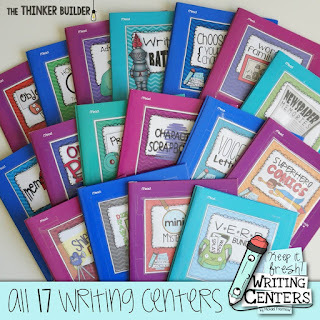 Writing Centers." The driving force behind creating them was to provide my students with opportunities to practice different forms of writing in a format that I could keep fresh and alive easily. Having 17 of them now gives students plenty of variety, but each center even by itself has built-in ways to, well, keep it fresh! There's also "Memory Twists," where students start with a true memory and twist it into fiction (Picture D), and "Object Mash-Ups," where students choose two objects to mash together into a new invention and then describe it in detail (Picture E), and "Adventures with Strange Items," where students use three random items in an adventure story to find a lost treasure (Picture F). 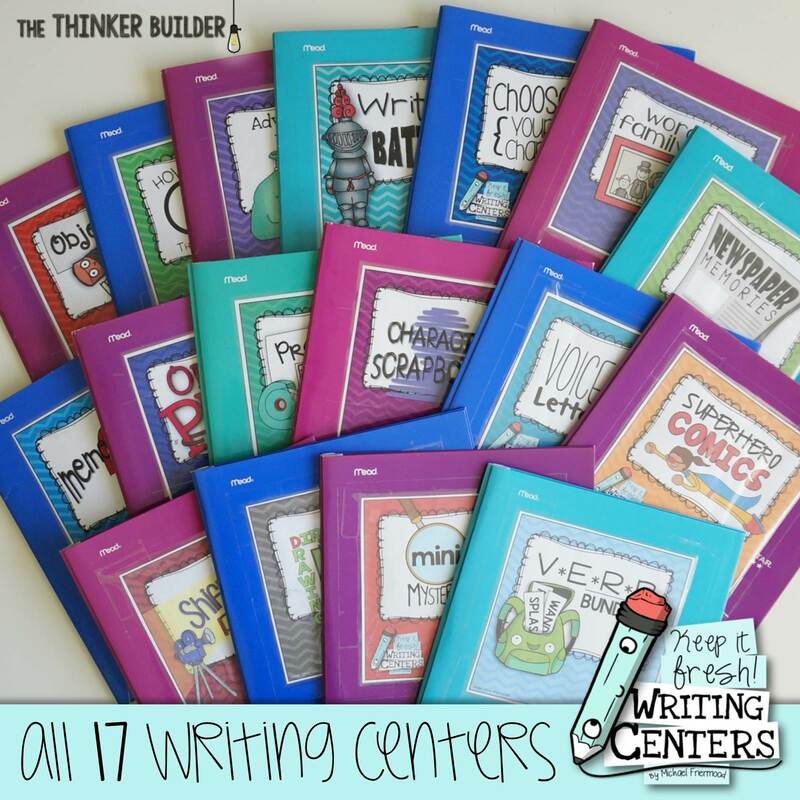 Other forms of writing from some of the other centers include: persuasive writing, poetry, interviews and articles, personal narrative, opinion, letter-writing, comics, story-writing from different points-of-view, mystery, and procedural-writing. 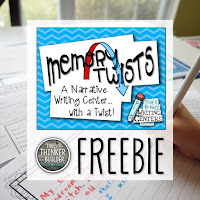 If you don't have any of the centers yet, and want to check one out, "Memory Twists," is totally free. You can download it from my store HERE. Goodness! 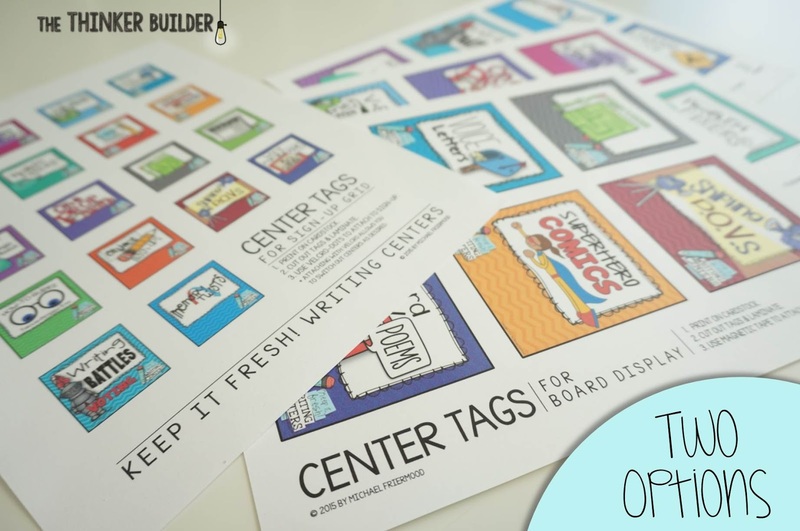 With so many centers available, I want to give some tips and guidance for how I assemble, organize, introduce, and manage the centers, especially for those of you who have them all. There's more than one way to put together and use my writing centers, but for now, let's stick with how I've done it with my students. I use a folder set-up, mainly so the centers are portable and students can take them to their desk or other work space. Detailed assembly instructions are included with each center (like you see to the left) that explain where each component fit on the folder, including labels, student directions, writing organizers, writing paper, and student tips. The materials used to assemble the folders in this way are shown below. 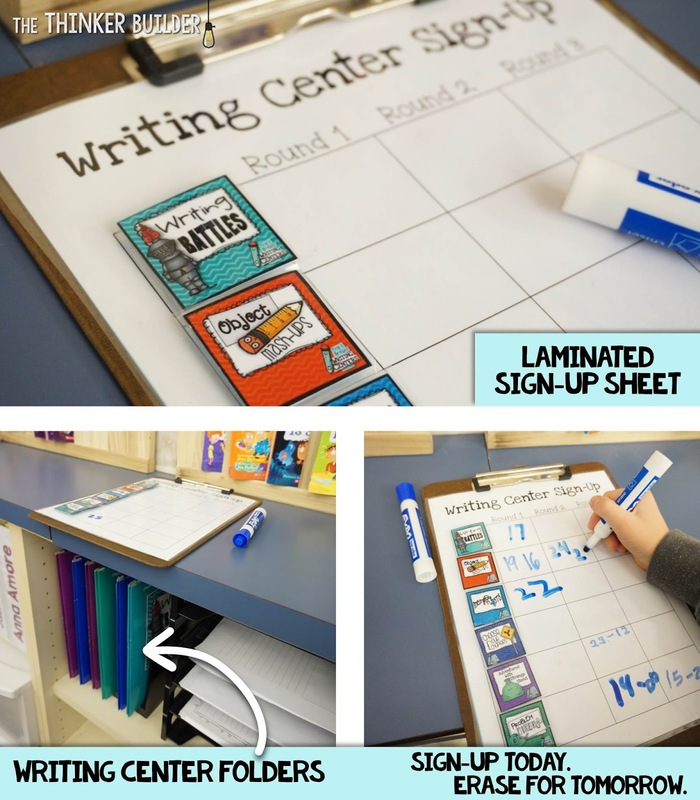 My students used the writing centers as a choice during their Daily 5 rotations, so I needed an efficient way for them to sign-up for the writing center they wanted, for the rotation they wanted. The accessory pack includes two options to make this happen. The second option, which I ended up preferring (mainly because it didn't take up space on my whiteboard) uses smaller "tags" of each center. I used Velcro dots on the back of each tag, and stuck the other side of each dot onto a sign-up sheet that I had laminated. Just like with the board display, I chose the centers I wanted to put out for the week and stuck those tags to the sign-up sheet. Students could then sign-up with a white board marker (which we'd erase for the next day). Below, you can get an idea of how my sign-up area looked last year. I kept the writing center folders that were available for the week on a shelf just below the sign-up sheet, filed in one of those vertical sorter thingies. My normal day included three rounds of Daily 5, but the accessory pack has several versions of the sign-up sheet in case your day looks different. I normally have six writing centers set out for students in a given week, so one sign-up sheet is all I use, but you could definitely use multiple sign-up sheets if you want more than six centers available at a time (see below left). All of those little center tags, especially the ones I'm not using for the week, need a home. So I attached extra hook-and-loop dots to the inside cover of my teacher-binder to store them (see below right). I keep all of the copy masters for the writing centers in a binder. (The accessory pack includes a cover and spine insert to "class it up.") A one-inch binder works well to hold materials for about four centers. I use a three-inch binder to hold the masters for all of the centers. 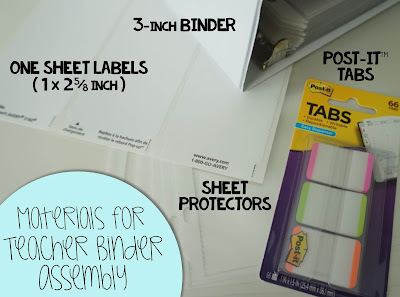 The rest of the materials to assemble the teacher binder like I did are shown below. 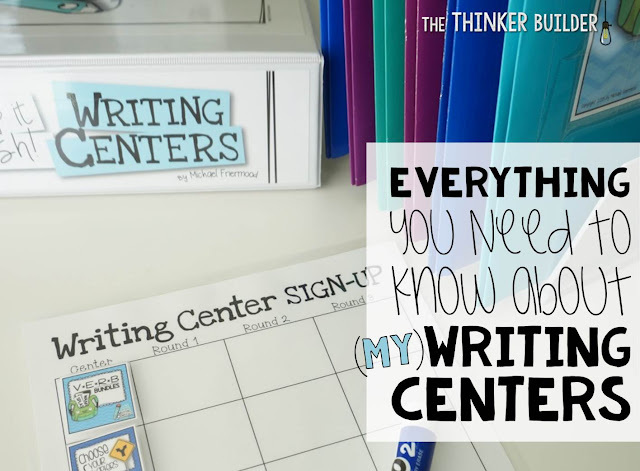 How you introduce the writing centers to your students depends a lot on how you want the centers to be used. Since I used a Daily 5 framework, where the writing center folders were available for students to choose from while I met with guided-reading groups, I needed students to be able to work independently on the writing activities. 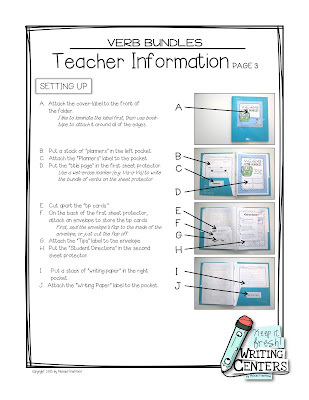 Several features of the writing centers help students in this regard, like easy to follow directions on what to do, as well as tip cards to strengthen students' writing. Still, I found the most success when I introduced each center to students before allowing them to choose them on their own. So for the week in which I wanted to begin, I took four of my writing centers, and introduced one a day, Monday through Thursday. 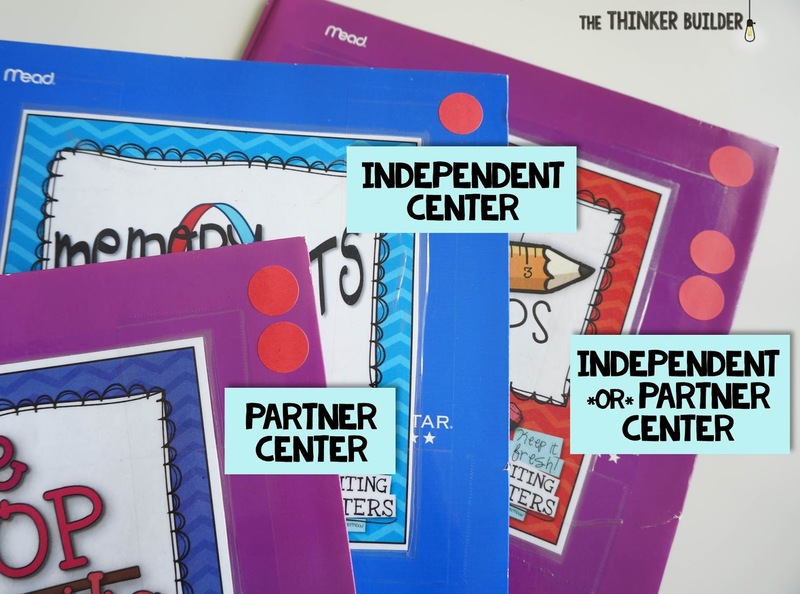 When I introduce a center, I gather students around and show them the folder. We walk through the directions and I orient them to where each piece is found: the planner, the writing paper, the tip cards, etc. 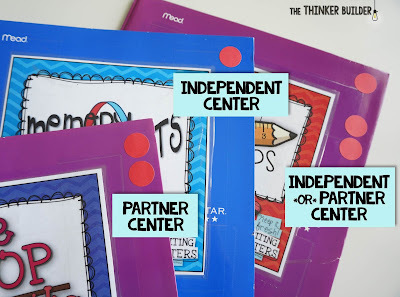 Then, depending on the center, we'll either talk through an example together or I'll give students the planner and writing paper to do a practice-run with a partner. On Friday, I remind the class of the four centers we introduced, and then I place them in the sign-up area. We then talk through the sign-up procedure. 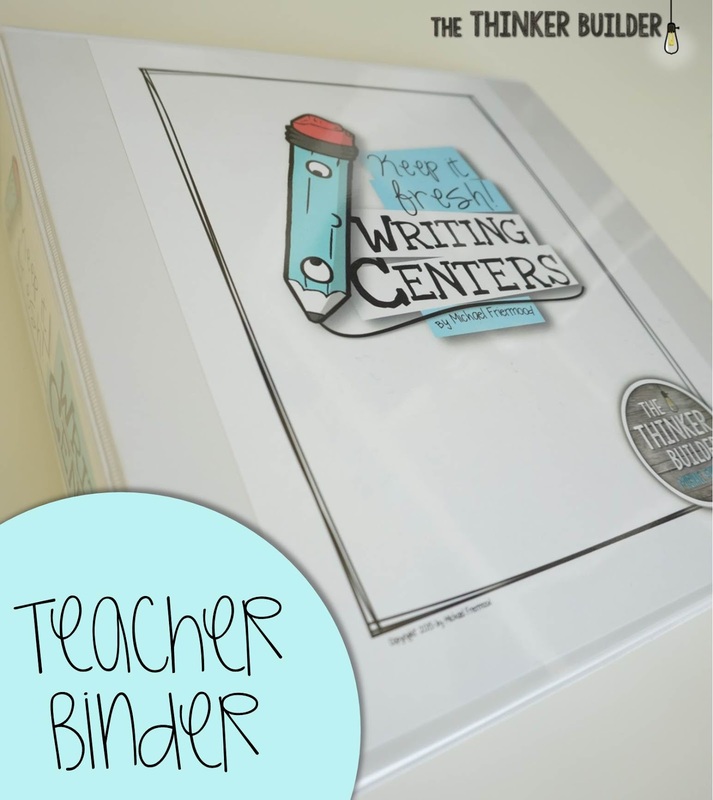 When a student signs up for a particular center on a particular round, she takes the folder to her desk at the beginning of the round and returns the folder at the end of the round so it's ready for the next person who signed up for that particular writing center. Some of the centers are meant to be done in partnerships, like "One Prop Skits," "Direction Drawings," and "Newspaper Memories." But many of them work well as partner OR individual centers. To signal whether a center can be done with a partner or not, I just put stickers on the edge of the folder. A single sticker means it must be done alone. Two stickers means it must be done with a partner. And a single sticker and a pair of stickers means the center can be done either way. The following week, the four centers that were introduced become available for students to sign-up to use. 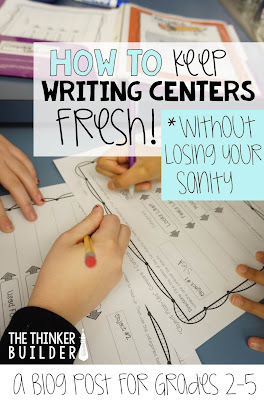 I usually wait a week or two before I introduce another four writing centers. Once I've introduced all the centers to the students, which takes me about six to eight weeks, I begin rotating the centers available to students. The number of centers I have available to students in a given week is mainly dependent on what I'm requiring from students during that week. Sometimes I leave the writing centers completely optional, which means I don't need to put out as many... maybe 4-6 for a week. But often I will require students to complete a certain number of centers, so I need to make sure the supply meets the demand... maybe 6-10 for the week. 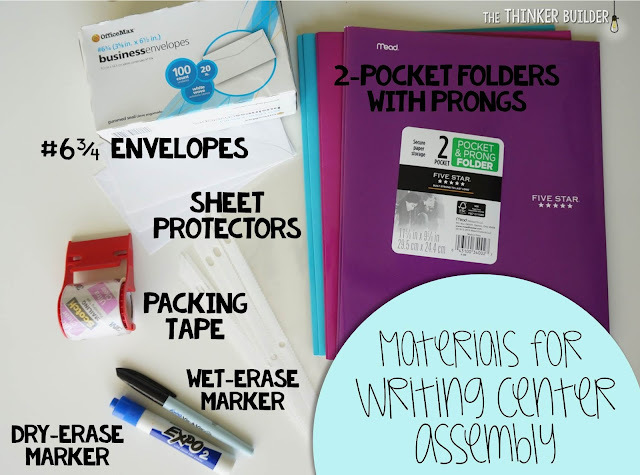 If there is a particular center that I want all students to complete during a week, I will just give each student the needed materials for the center to keep in their own writing folder. In the accessory pack, I've included a couple of student record sheet options for students to keep track of what is required of them. One is more of a contract set-up, and the other is more of a tic-tac-toe choice board. During the week, I have a basket for students to turn in completed writing activities. Usually on Fridays, we carve out a little time to share some of the final pieces. I record the information I need about who completed what. 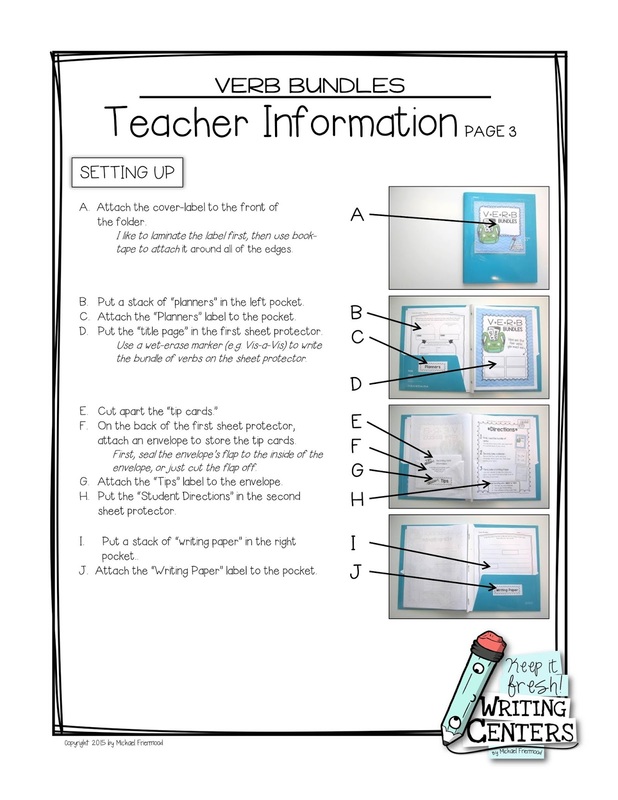 The accessory pack includes two teacher record sheet options. At the end of the week, I change out some or all of the writing center folders, and make sure each one is "freshened up." For example, on "Character Scrapbooks," I may change the type of character students create from a "very old person" to a "dog." Or for "One Prop Skits," I may change the prop from a "ruler" to a "calculator." 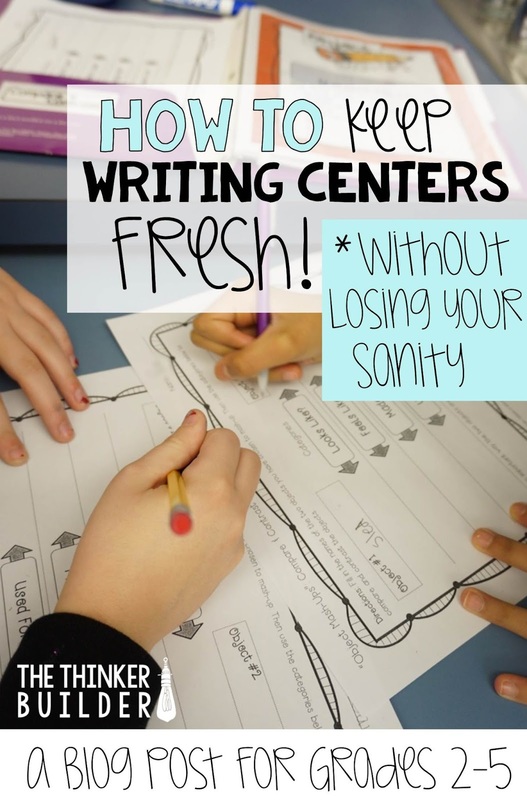 Since this is one of the crucial parts of maintaining the centers long term, TONS of ideas and suggestions for keeping each center fresh are included. 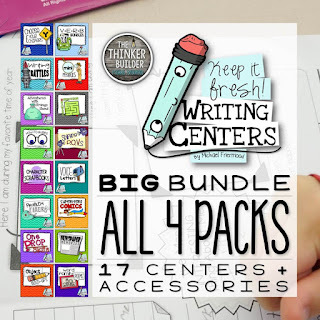 Click the image below to see the Big Bundle of writing centers! 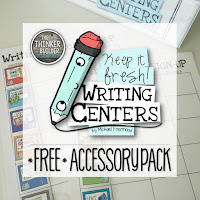 Or click below to grab my free Memory Twists center and free Accessory Pack!